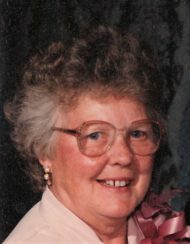 Nancy J. Yoder, 88, of Legends of Lititz and formerly of East Petersburg, passed away Friday April 12, 2019 at UPMC Pinnacle Lititz. She was born in Lancaster to the late Harold and Marie (Rote) Wendler. Nancy enjoyed 67 years of marriage to her husband Richard Yoder before his death in 2016. Nancy is survived by her daughters, Linda M., wife of the late Larry C. Hyle of East Petersburg, and Barbara J. wife of Ricky Eckman of East Petersburg. Also surviving are her four grandchildren, Shawn, Jason, Joshua and Justin and four great-grandchildren, Dylan, Tyler, Morgan and Summer. In addition to her parents and husband, Nancy was preceded in death by all of her siblings, and her son Richard D. Yoder in 1991. Private interment will take place in Riverview Burial Park, Lancaster, PA.
To the Yoder family – I am so sad to read that beautiful Nancy passed away. She and Rich were very dear friends of my parents Leo and Molly. I find solace in knowing that they are together again – dancing the night away to big band music! Peace and light to all of you. Have good memories of Nancy as she cut my hair several yrs ago. John and I are very sorry for your loss and will pray for your family.